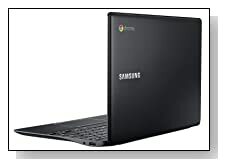 Samsung XE503C12-K01US Chromebook 2 is a sleek and compact 11.6 inch laptop computer in jet black or white options with a surprisingly nice and unique design with its textured leather-like cover, HD display, decent performance by its Exynos 5 Octa processor, good amount of RAM for multitasking, Chrome operating system and the ability to boot up and run things fast at a rather affordable price. 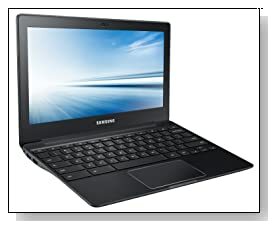 Samsung Chromebook 2 has an Exynos 5 Octa 5420 processor (2 MB Cache) at 1.9 GHz- offering performance power and speed, 4 GB DDR3L SDRAM (1x SO-DIMM), 16 GB Solid State Drive and the Chrome OS that help you perform your daily tasks by running mainly internet based applications- so you need to be connected to the web to be able to do most of your work including word processing, spreadsheets and photo editing. You can’t run Microsoft Word or Excel or other PC software on it but you can edit the files created with these programs easily on the Chrome based apps. Chromebook 2, like other Chrome based devices, has the integrated security features to be protected from viruses and any other evil stuff. Sandboxing technology makes sure that the Chrome OS and the applications are kept separate so that the viruses don’t cross-infect. 4GB size memory is more than enough for efficiently using many apps and browsers at the same time. There is also not a large Serial ATA hard drive to save your files directly on the computer as you find on PC laptops but a small 16GB SSD to help it boot up in 10 seconds or wake up from sleep almost instantly- in a second as you will be storing most of your files- music, photos, videos on the Cloud based Google Drive and not on the computer so that you can access them wherever there is internet on any device with your password. Not having a large HDD helps the Chromebook’s lightweight and slim factor. Free 100 GB storage by Google Drive is valid for two years, from the day you redeem the offer. You have access to the latest Chrome OS and its web apps constantly by the free automatic updates without you having to do anything manually. 11.6 inch LED HD display has the 1366 x 768 native pixel resolution with advanced image optimisation for entertainment and noise reduction features when you’re chatting on Skype or watching videos and superior playback and real-time video delivery. Chromebook 2 also comes with 2 x high power stereo speakers (2 X 2W) for great quality sound for its price. There is an HDMI port on the left hand side if you wish to connect it to your large screen HDTV. Other connectivity options include the (3 times) faster 802.11 A/C wireless for also better enjoyment of online media, Webcam with integrated microphone, a headphone port, 1 x USB 3.0 port, 1 x USB 2.0 port, Integrated Card Reader- a microSD card slot, DC in jack and a Cable Lock Slot. Conclusion: Samsung Chromebook 2 XE503C12-K01US is a nice looking (in both jet black and white colours) and well-built machine with some great features that is non-existent in many of the more expensive Windows based machines. It has an SSD rather than a conventional HDD so boots up much faster and offers snappier performance, efficient multitasking with the Exynos 5 Octa processor and the generous 4GB RAM, is very easy to set-up, has a keyboard and touchpad that gives you a similar feeling of a Macbook, has a very long battery life of about 8 hours in normal use, much faster wifi than what is available on most current laptops, integrated security features- automatic protection from viruses, free auto updates of Chrome operating system and apps and more.. Chromebook 2 is the ideal 11 inch laptop if you spend most of your time online and don’t want to spend too much money but still want something fast and powerful in a small and compact package.